The Duchess of Sussex wore a bright red coat by Sentaler and a purple dress by ARITIZIA's Babaton collection for the outing. The late Princess of Wales was also fond of this color combination. As royal admirers will recall, she wore a similar color palette when she visited the Taj Mahal in India in 1992. She also wore a similar scheme when she visited Hong Kong in 1989 and Thailand in 1988. Of course, this wasn't the first time Meghan had channeled Diana. She also honored Harry's late mother by wearing her diamond butterfly earrings and gold bracelet to Australia, where she and Harry took part in their first royal tour as a married couple and announced her pregnancy. In addition, Meghan wore Diana's emerald-cut aquamarine ring to her wedding reception back in May and paid tribute to her late mother-in-law with her bridal bouquet. 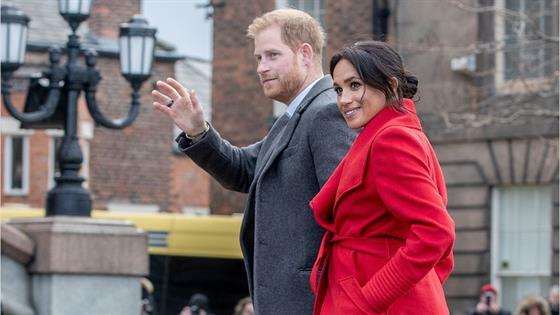 The outing marked Harry and Meghan's first joint appearance of 2019; however, this wasn't the only reason the engagement made headlines. During a walkabout in Hamilton Square, the pregnant royal revealed she's six months pregnant and that the baby is due around April or early May. This was the most specific update royal admirers have received about the baby's due date. Meghan had reportedly hinted she was "nearly there" during a visit to Sandringham in December. This wasn't the only time Meghan talked about her bundle of joy during the visit. She also received a few baby name suggestions from well-wishers. Although, she had previously hinted she and her hubby already had a "long list" of ideas during the royal tour. It was certainly a busy day for the royal couple. They also visited a new sculpture in the Square that was erected in November to mark the 100th Anniversary of poet Wilfred Owen's death. They then headed to Number 7—a citizen's market and community café that's part of the Feeding Birkenhead initiative. In addition, they stopped by Tomorrow's Women Wirral—which offers training and workshops for local women and offers support groups for women experiencing mental health issues, domestic abuse or addiction. Finally, the future parents ended their visit with a stop at the Hive Wirral Youth Zone, which offers young people a safe place to gain skills and fuel their aspirations.